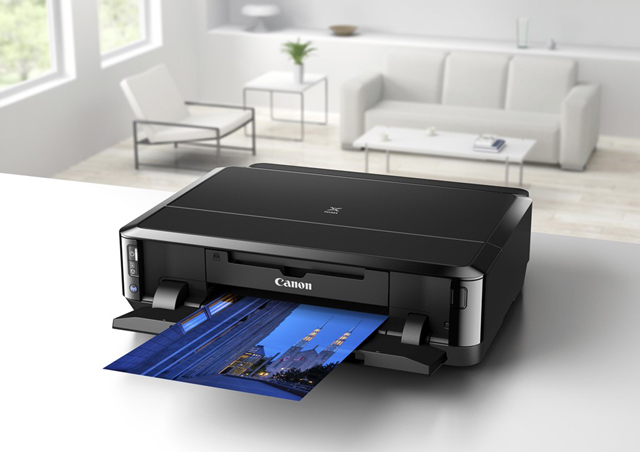 It’s not often that I run across a single-function inkjet printer, especially in the low-volume, low-price, consumer-grade photo printer arena—where the printers themselves are relatively cheap but the ink that drives them is sky high. And that’s the case with today’s single-function Pixma, the $79.99 Pixma iP7220 Wireless Inkjet Photo Printer. Just as the Japanese imaging giant’s five-ink Pixma “MG” all-in-ones (AIOs) print splendid-looking photos, so does this five-ink single-function Pixma. At 17.8 inches across, 14.5 inches from front to back, 5.1 inches high, and weighing a trim 14.4 pounds, this short little single-function photo printer won’t take up much space on your desktop, and when it is printing, it doesn’t make a lot of noise, making it rather well-behaved neighbor. There’s no reason, of course, for a single-function photo printer to have an automatic document feeder (or ADF), of course—it has no scanner. In addition, this one is short on mobile connectivity features, such as Near-Field Communication (NFC), Wi-Fi Direct, and support for several cloud sites often available to most other printers nowadays. What you do get is support for Apple’s AirPrint, auto-duplexing for automatic two-sided printing, CD/DVD/Blu-ray disc labeling (on appropriately surfaced discs), and a one-year warranty with the InstantExchange program. Then, too, there are Canon’s own utilities, such as Full HD Movie Print for printing frames in movie clips, Fun Filter Effects, and My Image Garden for managing images on line. If you for some reason (perhaps, documents at a point-of-sale) you need a fast printer, you should look elsewhere. If you’re looking for a photo printer that can churn out documents at a reasonable clip, Epson’s Small-in-One models, such as the Expression Premium XP-830 Small-in-One, will do the trick. Print quality, on the other hand, is another story. Photos and documents consisting of text, business graphics, and embedded photos, all looked quite good, with text coming very near to typesetter-quality, and images that meet and exceed drug store-quality. That fifth ink, the Pigment Black, goes a long ways toward correcting flaws in black and other dark areas in photographs, in some cases greatly increasing overall consistency. Like most low-end Pixmas, this one has only one input source, a 125-sheet cassette for standard paper, with an insert inside that holds up to 20 4x6-inch sheets of quality snapshot paper. Since all this Pixma does is print, you can’t really expect much else. This really is a niche printer. Like most photo printers, though, its per-page cost of ink is too high for printing documents, period. Here, with its recent drop in price to $79.99, and the machine it self’s diminutive size, this seems like a good candidate as a second printer—a photo printer—used only to zip off keeper photographs of the family on vacation, or maybe some images of the latest house you took to market. All it does is print, and it prints photos best.